The Department of Recreation Services and the Syracuse University Wellness Initiative are partnering once again to host the SU Staff & Faculty Challenge Days, which will be held from 10 a.m.-noon on Saturday, June 4, and Saturday, July 23. Syracuse University staff and faculty and their immediate family members are invited to experience the outdoor high ropes challenge course, located behind the Inn Complete at the Outdoor Education Center on South Campus. Faculty and staff members and their families are invited to experience the Challenge Course on June 4 and July 23. Staff, faculty and family members must present valid SU I.D.s to participate, be at least 7 years old and weigh at least 50 pounds. The registration fee for this program has been subsidized by the Syracuse University Wellness Initiative, bringing the cost for SU employees and their immediate family members to only $10 per person. Pre-registration and payment are required in order to participate. Staff and faculty can bring a check and fill out the registration form by visiting Recreation Services (241 Archbold Gym) or the University Wellness Initiative (Suite 101, Skytop Office Building). Pre-registration is due by May 23 for June 4 participation or July 11 for July 23 participation. 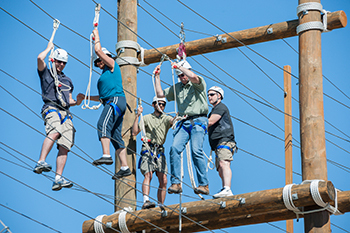 The Outdoor Challenge Course opened in September of 2013, and since then has offered numerous campus departments, organizations and community groups access to an engaging team-building and wellness activity. The challenge course features high elements with both static and dynamic belay systems, including the dual zip line and triple leap of faith. For more information, visit the University Wellness Initiative website or contact the Outdoor Education Center at 315.443.9935.